Energy savings and initial cost reduction will be realized when the basic physical science rules are followed as presented in the Engineering Data section of our catalog. The formulas and tables contained therein are proven. 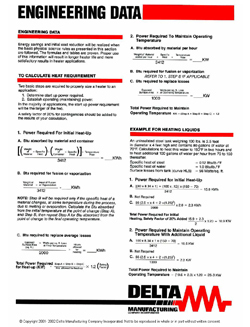 Proper use of this information will result in longer heater life and more satisfactory results in heater applications. For more information about engineering data, as well as formulas, graphs, and tables, download the Engineering Data section of our product catalog.